Music Outreach Thematic Recordings are a new, unique alternative to expensive live performances! They Combine the personal style of a live performance with the portability and thrift of a recording. Your residents will want to see and hear these recordings again and again!!! Michael plays a variety of instruments, and his excellent singing. Warm personal style and uplifting content make these recordings a sure success! "Christmas and Hanukah." Original poems by poet Michael D. Purvis, the story of Hanukah, the Christmas story in scripture, Santa, sacred and secular Christmas songs. A holiday program you won't want to miss! 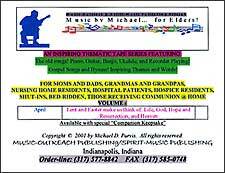 Also be sure to order the special "Companion Keepsake"
© 2001 by Music Outreach. All rights reserved.